Like many districts, La Porte Community School Corporation in northwest Indiana was having trouble reaching the growing segment of its high school population that was not on track to graduate because students lives got in the way of academic success. They might have health problems preventing them from attending school, jobs that are necessary for their livelihood, childcare challenges that keep them out of the traditional school environment, or difficulties with attention or disruption in class. With these students in mind, La Porte Community School's Virtual Learning Academy was established at the beginning of the 2012–13 school year. The original purpose of the Virtual Learning Academy (VLA) was credit recovery for students who could not participate in the traditional school setting. On opening day, seven students were enrolled in the VLA. In the fall of 2013, the VLA began its second year with 181 students working on 277 courses in three different locations. The rapid scalability was made possible in part by the adoption of Plato Courseware and Edmentum Accucess. A suburban school district in the Midwest opened a one-of-a-kind blended learning academy to meet the complicated needs of their at-risk high school students. Plato Courseware and Edmentum Accucess have been there since the beginning and will continue to be there as the academy scales to service all of the schools in the district. "I believe that our academy is unique," said La Porte VLA's director, Janie Ulmer. "We partner the online coursework with face-to-face support. Students respond well to the personal interventions, and we are seeing strong results in achievement. . . . Standards-based academic content and quality direct intervention [are] the secret[s] to our success." Students use the virtual Plato Courseware for their academic instruction. Licensed teachers and trained paraprofessionals are there to motivate and support the students behaviorally. Meanwhile, students use the facilities at La Porte High School (LPHS) to meet with teachers, collaborate with their peers, and complete any assessments. Individualized learning plans are a collaborative process between the student and La Porte's guidance counselors, administration, and teachers. Teaching her nontraditional students traditional academic skills is another important goal for Ulmer. "My students need to learn 'how' to learn," said Ulmer. "However, my nontraditional students need to make the jump to independent lifelong learners. In the Virtual Learning Academy, creating lifelong learners is our focus." The La Porte VLA is the best of both worlds, offering the flexibility of online learning with the services and facilities of a traditional school environment. Our program is successful for two reasons: content and people. Edmentum provides standards-based courses which include both formative and summative assessments. Our staff utilizes the data from the formative assessments to help students 'learn to learn' with the online content. With Plato Courseware and Edmentum Accucess, the La Porte VLA outpaced its expectations in its first year. Fifteen students, who probably wouldn't have had the opportunity otherwise, earned their LPHS diplomas through the VLA. Fifty-three students met their academic goals as set by the LPHS administrative staff. In all, 375 academic credits were earned through the program in its first year. "Our program is successful for two reasons: content and people," said Ulmer. 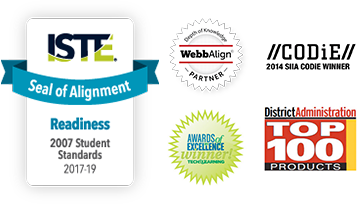 "Edmentum provides standards-based courses which include both formative and summative assessments. Our staff utilizes the data from the formative assessments to help students 'learn how to learn' with the online content. Students must engage in the content and maintain their own reference notebook. Students choose the 'key areas' that should be included in the content. The content works well, and our staff works hard to encourage struggling students, reward student success, and guide students towards achieving their next goal." The growth experienced by La Porte's Virtual Learning Academy in its first 18 months is nothing compared to what will happen next. Ulmer plans to collaborate with the district's elementary and middle schools to offer learning opportunities for those students, as well as provide virtual professional development opportunities for the district's teachers and staff. Eventually, dual enrollment will be made possible through a partnership with local post-secondary institutions.